Preheat oven to 350F and line a cookie sheet with parchment paper or a non-stick baking mat. Set aside.In a large mixing bowl, combine almond flour, coconut flour, baking powder, and salt, mixing until well combined. Add melted coconut oil, maple syrup, and vanilla, and mix until ingredients are well combined and dough begins to thicken. Add cinnamon and sugar to a small bowl. Scoop out a rounded tablespoon of dough and roll it between your hands to form a ball. Roll the cookie ball in the cinnamon sugar and place it on your prepared baking sheet. Repeat until all the dough has been used up, and then use a jar or flat-bottomed cup to gently flatten each cookie. Bake for 8 minutes, or until the edges begin to turn golden brown. Remove from oven and allow to cool on sheet for ~5 minutes before transferring to a cooling rack to cool completely. Store cookie in an airtight container for up to 5 days. 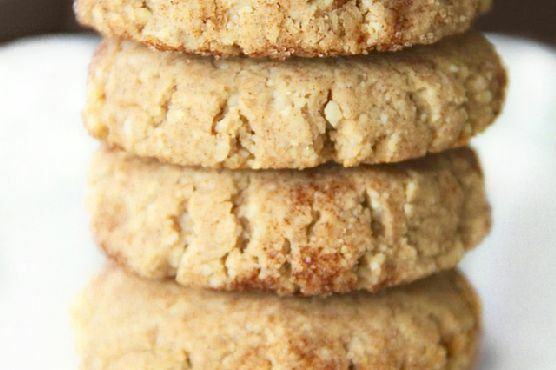 Cream Sherry, Madeira, and Prosecco are my top picks for Snickerdoodle. Sweet bubbly Prosecco doesn't overwhelm simple sugar or shortbread cookies, a sweet cream sherry complements spiced cookies, and madeira's nutty notes match cookies with nuts perfectly.